Flora González — @FloraGonzalez —“I believe in the power of a chain of love” that’s the mantra of Johanna Mejía, founder of Amalena, who left her career as a broker in Bogotá to fight for her creative dream in Austria. After several years of studying and training she founded Amalena, an ethical and eco-friendly jewelry company to which this original piece belongs. 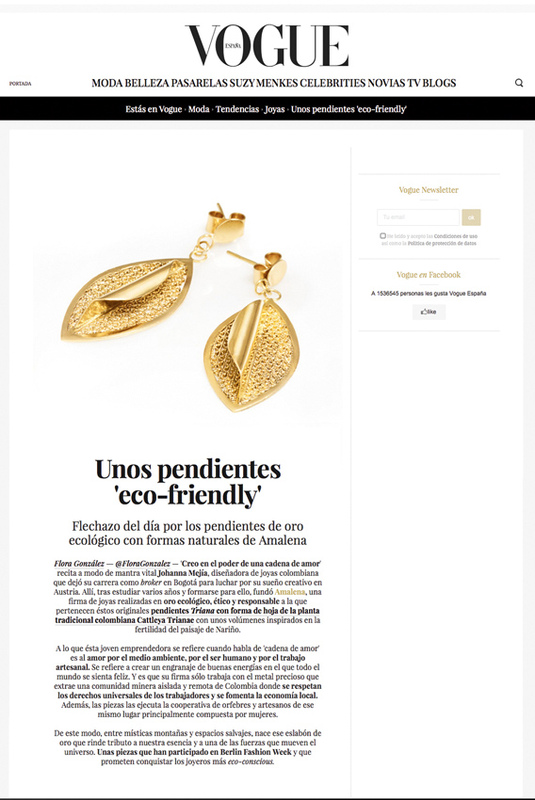 The Triana Earrings with a leave shape of the Colombian national flower, Cattleya Trianae, is inspired by the fertility of the landscape of Nariño (Colombia). With “Chain of love” this young entrepreneur revers to the love for the environment, human beings and artisan work. It is about creating a positive energy where everyone feels happy. All the pieces of Amalena are created exclusively with a precious metal extracted from an isolated and remote mining community under fair trade practices promoting local development. The jewels are then handcrafted by the local cooperative of artisans formed by women. In this way, the mystical mountains and wild landscapes are the place of birth of this gold, which pays tribute to our essence and to one of the forces that moves the universe. The pieces of Amalena took part at the Berlin Fashion Week and promise to conquer the most eco-conscious jewelers. An article from Johanna Mejia, the founder of Amalena about fair gold and artisanal and small scale mining was published in the Austrian magazine DKWE.